Bubble letters are great fun. 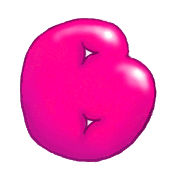 Sometimes, the term is used to refer to any 3-D letterform but to me, the ‘bubble’ in the name means that the letters really should look like bubbles or balloons: rounded, bulging, colourful and shiny. This kind of bubble writing is playful and friendly-looking, so it’s usually most appropriate to use for cartoons and humorous titles, posters, logos, graffiti designs, or celebratory party-style texts. 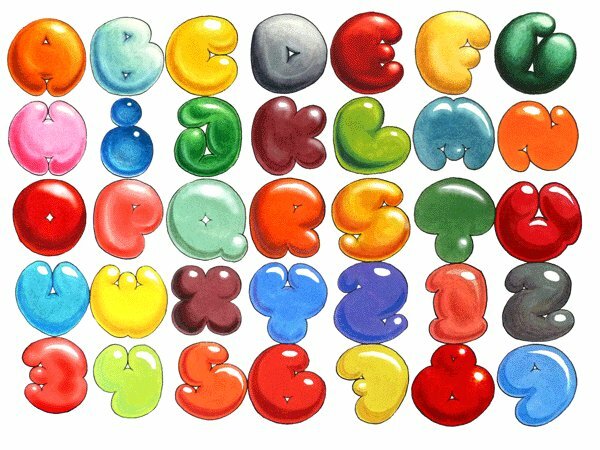 The basic principle of my bubble alphabet is to draw each letter to fill a circle as nearly as possible. I then turned each letter design into a step-by-step method that you are free to print and use (but not sell). Hopefully you can invent your own, even better alphabet! Of course, if we are going to be strict about definitions then bubble letters of any kind are not really a form of calligraphy. Calligraphy is writing that is created using particular pen-angles or brush-movements, so that the form of the letters reflects the character of the tools and materials used to make them. By contrast, bubble lettering is a type of hand-lettering – fancy letters that are drawn using a simple outline, and then shaded or coloured for a special effect. Anyway, I include bubble and balloon letters on this site because all kinds of hand-drawn letters have been part of scribal practice and illuminated manuscripts since time immemorial – and also just because I like them.